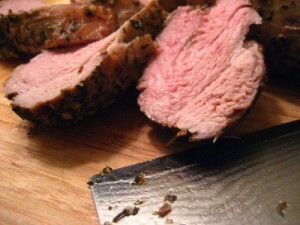 Pork Tenderloin may very well be one of the best choices of meat a cook could choose. The trick is knowing how to cook a pork tenderloin properly. One of my all-time favorite recipes for this delicious dish is simple, yet tasty. Lay each tenderloin in a 9×13 inch baking pan. Cover both sides of the tenderloins with mayonnaise. Crush the contents of the soup mix with a spoon. Evenly cover each pork tenderloin with the crushed onion soup mix. This dish will satisfy even the picky eater. Pork tenderloin is very flavorful so it pairs very well with baked cinnamon apples. Many people also enjoy cabbage or a green vegetables as well. Many wines compliment this dish such as a soft red, like Merlot or a light red like Pinot Noir. No matter what you chose this recipe can turn a good meal into a great one.